September brings us figs, a summer re-cap, food and music and a local food award nominee. Season’s Eatings – what foods are in season for September? Here’s a number of different fig recipes from Buzz Feed. We particularly like the idea of chocolate coated figs (coating anything in chocolate can only improve it in our opinion!) 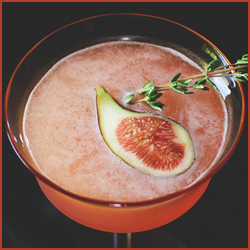 and fig thyme cocktail. Cheers! Did you catch our summer kitchen activity guide? We ran 6 blog posts over the 6 weeks of the school holidays with lots of ideas for things for the kids to do in the kitchen. It may now be September and time to go back to school but there are still lots of ideas in there that you can still do on a rainy day (especially now that the weather seems to have turned decidedly autumnal already!). You can catch up with all the posts here. We were pleased to see local company Blacker Hall Farm named as Best Farm Shop Retailer in the Farma Local Food Awards and in the shortlist for Best Farm Shop in the Yorkshire Life Food and Drink awards. It's great to have such a well regarded food retailer right here in Wakefield. 0 Responses to "The 3Style Foodie Blog – September"